Chinese emergency workers have managed to right the passenger ship ‘Eastern Star’ that capsized in severe weather on Monday night with 456 people on board. The move comes as hopes of finding any more survivors from the Yangtze River tragedy are fading. The death toll from the catastrophe rose to 103 early Friday morning. Only 14 individuals have been rescued, including the captain. 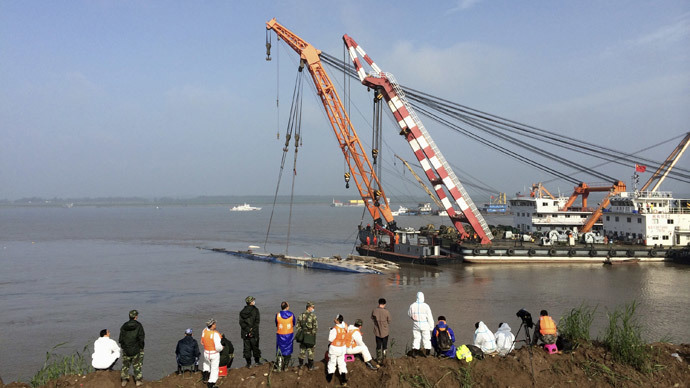 A ship carrying more than 400 people and some 50 crew members capsized and sank on Monday night while on the way from China’s eastern Jiangsu province to the southwestern city of Chongqing, leading to China's worst shipping disaster in decades. Two orange cranes were used to right the Dongfangzhixing.Earlier, holes had been cut into the ship and hooks welded in. A net was used to lift the ship, which was floating on its side nearly completely submerged. Rescue efforts have shifted from looking for survivors to recovering bodies from the ship’s 150 cabins. The majority of the survivors managed to jump overboard as the ship was sinking. Three people were found in air pockets under the hull and were successfully rescued by divers. The Chinese government has pledged that the truth will be uncovered, promising no“coverup”during the investigation into why the ship capsized. However, family members have become more and more frustrated with authorities, blaming them for not providing enough information on the disaster. Many have asked why the captain and the crew had time to put on life jackets, but not to send out a distress call. By Thursday more than 1,200 family members had arrived at the scene. “Over 50 percent of the families have already arrived in Jianli. We attach much importance to the psychological treatment for the family members, because a number of them will be full of feelings of grief,” the head commissioner of Jianli county, Huang Zhen, said according to Chinese state broadcaster CCTV. Dozens of angry relatives broke through a police barricade on Wednesday, marching several kilometers towards the river.